Just What is a Cylinder Head? A cylinder head is a critical part of your engine. With the head gasket and cylinder itself, it creates the combustion chamber that allows the combustion process to occur properly. It also lets air in and exhaust out. Coolant and fuel both flow through your cylinder head, making its health vitally important to the overall function of your engine. There are several main symptoms of cylinder head problems—high oil consumption, bad fuel mileage, and engine overheating to name a few. You can watch our video for more information. One of the most common cylinder head issues is cracks caused by overheating. These cracks often occur between the valves, but not always. Sometimes, if your engine has high mileage and the valve stems or valve guides are worn out, oil can begin to leak down into the combustion chamber. If your valves aren't sealing properly, combustion will be affected and you won't get the efficiency you want in your engine. Cracks through to your fuel system can allow fuel to infiltrate your engine oil. This contamination can lead to other major engine issues. These problems, if left unaddressed, could mean serious trouble for your engine, and even result in total engine failure. Often, the best solution is to replace your cylinder head. You have a few options when it comes to replacing your cylinder head. 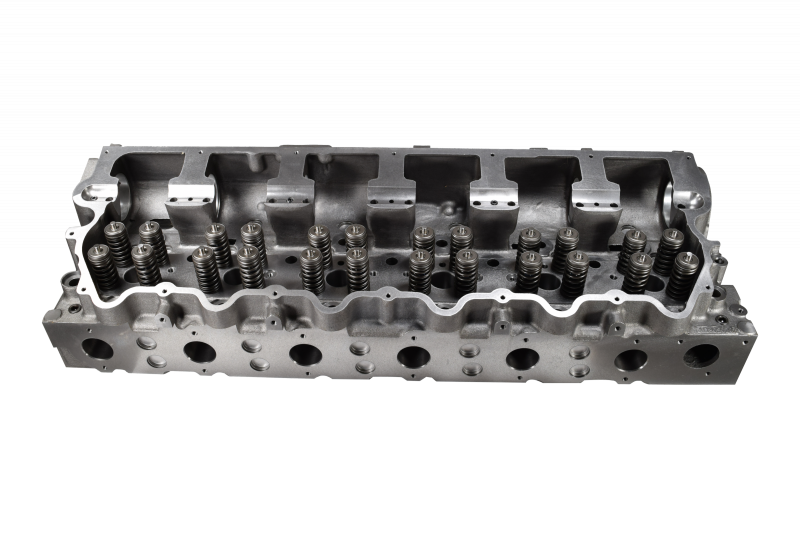 Read our past blog, Rebuilt Cylinder Head vs. Remanufactured Cylinder Head for more information on this. Cylinder head cracking is a quite common problem that can lead to other issues. Excessive heat causes the head to expand and contract, which leads to cracking. Depending on the model, the head is sometimes made of a different material, which can make this problem worse. A crack in your cylinder head could go through to your coolant passages, which allows compression gases from the combustion cycle to fill those coolant passages. This displaces the coolant, which causes the head to overheat in certain areas. This overheating tends to crack the head worse. This could be caused by valves that aren't sealing and creating the right pressure in the combustion cycle. In this case, you'd be putting significantly more fuel in the engine to get the same amount of power. Sometimes the valves and valve guides will wear, or seals will come off or get dislodged (knocked or forced out of position), allowing oil to enter the intake or exhaust ports, which causes high oil consumption. White smoke can also be an indicator of cylinder head problems. In extreme situations, white smoke can come from the engine itself, indicating that coolant has contaminated your oil due to a cracked or damaged head. It could also indicate exhaust gases escaping through the cylinder head, which signals the need to replace it. It's important not to ignore these warning signs. While these symptoms might indicate issues other than your cylinder head, don't assume it's not your head. Be sure to evaluate the health of your head to try and prevent catastrophic engine failure from costing you even more time and money. If you have any questions about cylinder heads, feel free to give one of our certified techs a call at 844-215-3406. You can also request a quote online to find the best fit for your engine.